This gorgeous ring showcases a shimmering cultured freshwater pearl set on a 9ct white gold band, adorned with three diamonds set leaves either side. Ideal for adding a touch of glamour to her everyday wardrobe or a beautiful accessory for a formal event. 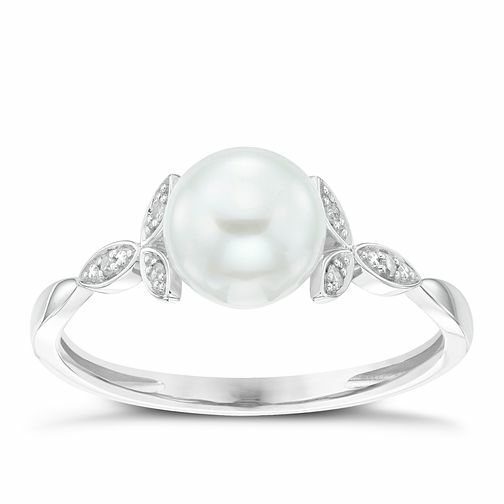 9ct White Gold Cultured Freshwater Pearl Diamond Leaf Ring is rated 3.7 out of 5 by 3. Rated 5 out of 5 by Anonymous from My engagement ring My partner bought this for me as an engagement ring after I chose it on the website. We went to Meadowhall to collect it after I ordered it online. The staff there were lovely and one of the ladies there educated me on how to look after pearls after asking me and discovering that I'd never owned a pear ring before. I generally would keep all of my Jewellery on for showers and swimming but she explained that this would endanger the pearl and she even gave me a velvet bag to store it in securely in my locker whilst swimming.